Warm up the engine so oil contaminents will drain more thoroughly. Park the vehicle on a solid, level surface and set the parking brake. Note: It may be necessary to lift the front of the vehicle to gain access to the oil filter and the drain plug. 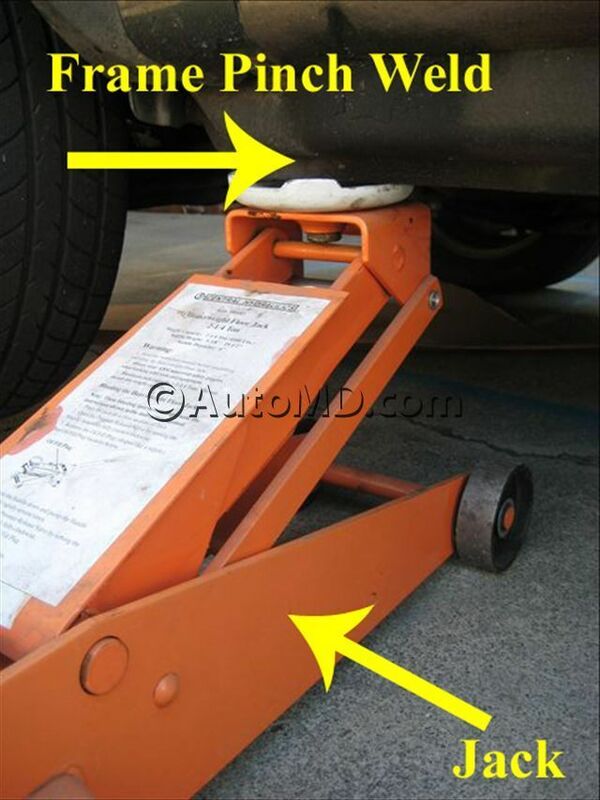 Make sure you support the vehicle with jack stands or place the vehicle on car ramps. Open and support the hood. Locate the oil fill cap on top of the engine. Remove the oil fill cap. Place a drain pan under the engine. Put on some latex gloves and remove the oil drain plug with a box end wrench or socket and ratchet. 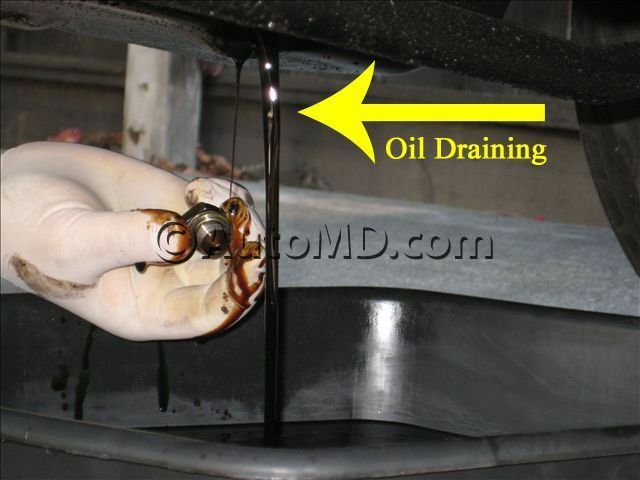 Allow the oil to drain thoroughly before re-installing the drain plug. Replace the drain plug gasket if damaged or cracked. Slide the drain pan under the oil filter. Using an oil filter wrench, remove the oil filter. Wipe off the filter mounting surface with a clean towel. Coat the new oil filter gasket with engine oil. 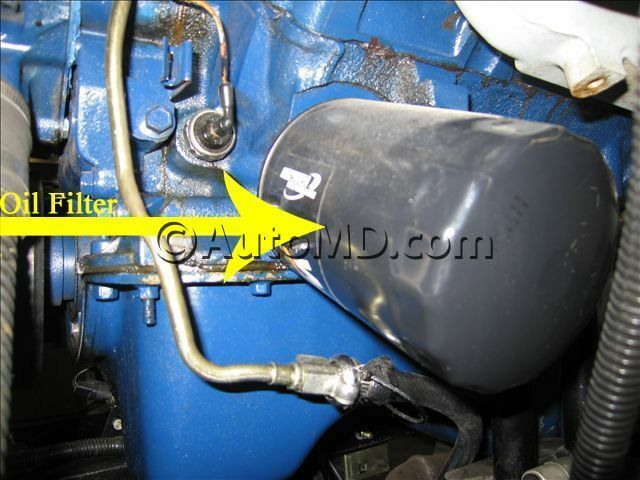 Install the new oil filter by hand until the gasket makes contact with the filter mount. Turn the oil filter one-half to one additional turn to seal the gasket. Re-install the oil drain plug with a new washer. Tighten the drain plug to the manufacturer's specifications. 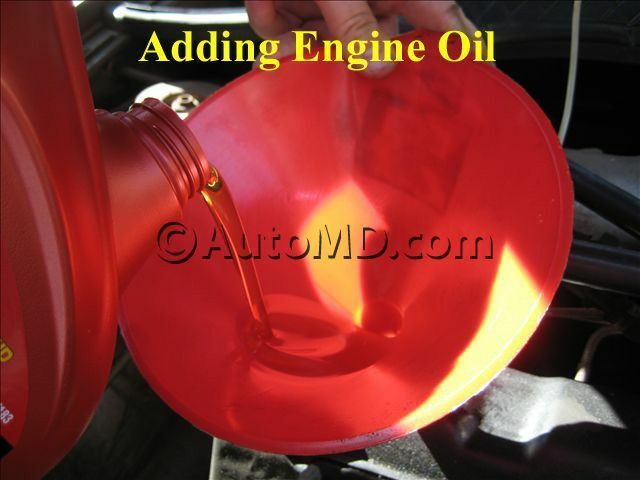 Fill the vehicle engine with the manufacturer's recommended engine oil type and amount. Refer to your vehicle owner's manual if you are not sure. Re-install the oil fill cap and start the engine to circulate the oil. Check for leaks while the engine is running. Place the vehicle on level ground if the vehicle was lifted. Turn off the engine and check the oil level with the oil dipstick. Add oil if the level is not at the full mark. One quart will raise the level from the add mark to the full mark. Do not over fill the engine.